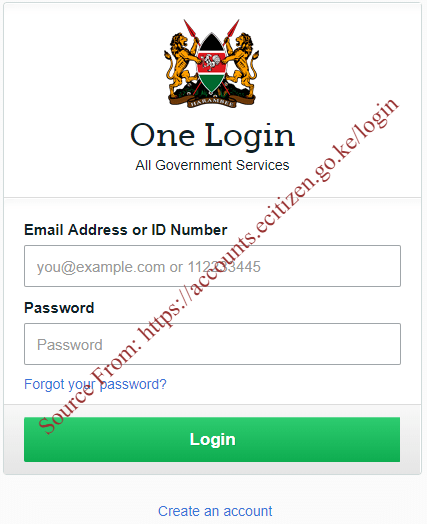 Creation Procedure on Kenya new ecitizen Login account in accounts.ecitizen.go.ke/login website…. With the use of the internet, you no longer have to worry about moving from your current location to get a service that you require. Through the eCitizen Login portal, Kenyans and any other person are allowed the opportunity of applying for different services offered by the Government of Kenya. Initially, it would take more than one day to get a given service but thanks to the eCitizen portal these services can now be accessed within minutes. However, before you access these services, one has to create an account in the portal. For this to be possible, you must have an internet connection and a device that can help you gain access to the network. If you want to open an account with Kenya eCitizen Login portal, then you have come to the right place. Below is a step by step explanation on how you can create an account in https://accounts.ecitizen.go.ke/login Website. On your browser, type in https://accounts.ecitizen.go.ke/login as the link for accessing the official eCitizen website. eCitizen Kenyan Citizen- This account is set aside for Kenyan citizens. eCitizen Foreign Residents- Foreigners residing in Kenya use this account to access services. eVisa Visitors- Any national who wants to get a Visa in order to enter Kenya will open this account. eBusiness Business- This account is specifically set aside for businesses in Kenya. Click on create account option found in the eCitizen Kenyan option if you are a Kenyan citizen. This action will automatically redirect you to a different page on the site. In this new page, enter your personal details such as first name, ID number, and registered mobile phone number. Once you are through click on the button that is displayed after the details to accept the terms and conditions. After all the details have been correctly filled, click on “Continue” button. In the new page that appears, you will be able to see your passport size photo, ID Number and Full Names. Enter you the email address that you are currently using together with your gender. You will also be requested to enter a password which you will use when logging into your Kenya eCitizen login. Click on ‘Continue’ button once you have entered these details. You will then be required to verify your Email address by clicking on the verification link that will be sent to your email. Upon the successful verification of your email, click on “Next” to continue. Now verify your mobile phone number by entering the One Time Pin (OTP) that is sent to you in form of an SMS. Click “Verify” after you have entered the verification pin. Finally, you will be required to upload a recent passport size photo. Once the photo has been uploaded, click on “Continue” to complete your registration on the eCitizen portal. 48 pages Ordinary ‘B’ series. There is also an option of making payments online once you have applied for the passport that you wish to use. Business owners can also register their business name on the eCitizen portal. Through this service, you will be given a license which is required when starting a new business. The government is also able to know the number of registered businesses in the country by having a look at all the registered business names. A Kenyan citizen can also apply for a land clearance certificate from the government of Kenya using the eCitizen website. All land clearance certificates are held by the Ministry of Lands and a landowner will have to pay a small fee in order to access it. The Government of Kenya through the eCitizen portal allows all foreigners to apply for a Kenyan Visa online. Before visiting a Kenyan Embassy in your country, you can apply for the Visa online within a matter of minutes. Once all the details have been processed by the Embassy, you will be allowed to visit Kenya for a specified period of time. Married couples can apply for a marriage certificate on eCitizen website once they have conducted their marriage ceremony whether in church or a court of law. A marriage certificate basically proves that the marriage is legal. You no longer have to worry about looking for the name of a registered business since it can be easily done on the eCitizen portal. The portal contains a full list of all the registered businesses and companies in Kenya hence it will not be difficult to find the one that you are looking for. Apart from the mentioned services, you can be able to commission affidavits, apply for a special license for marriage and solemn your marriage on the eCitizen portal. Before getting any service on eCitizen portal, you must pay a fee depending on what you want. Payments can be made through mobile banking, mobile money, credit cards and Debit Cards.